The perfect vanishing-edge pool creates the illusion that the pool continues into infinity. By building the rear wall of the pool to lack coping and placing the bond beam exactly at water level and not above, this can create the effect of an uninterrupted line of site using the water to blend the foreground into the background. These types of pools are also known as infinity-edge or zero-edge, a water feature that is popular for both pools and spas. Determining the site to build is critical in being able to build a vanishing-edge pool. The most ideal location consists of a gentle slope although any site can work. Another thing that must be taken into consideration is the view. Most of the vanishing-edge pools we see are built at luxury hotels or near large bodies of water but the illusionary effect can blend into any type of scenic background. The design of a zero-edge pool is reliant upon a catch pool in either trough or basin form. This is an area that collects the water that spills over the edge and pumps it back into the pool’s system. The weir is the upper sloping surface of the spillover wall. This key feature is what creates the vanishing-edge effect. Several considerations of the weir are slope direction, surface material, forming method, and waterproofing. 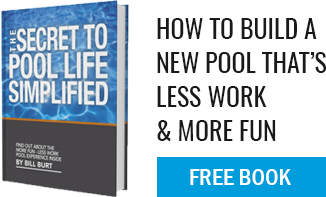 Due to the nature of how vanishing-edge pools are constructed, it is recommended to install a secondary pool pump and filter that are dedicated to the catch pool. This prevents debris and promotes circulation between the catch pool and the main pool’s system. Although complicated, vanishing-edge pools are a great way to create unique views and capitalize on the beauty of nature from your pool!